What is peat, exactly? According to Wikipedia, peat is an accumulation of partially decayed vegetation or organic matter that is unique to natural areas called peatlands or mires, which represent 50 to 70% of global wetlands. Peat is harvested as an important source of fuel in certain parts of the world, and it covers around 2% of global land area. And Russia’s got plenty of it! The country’s responsible for 17% of the world’s peat production, and 20% of that is used for energy purposes. Use of peat for energy production was prominent during the Soviet era (though it sharply declined in the 70’s). In fact, the world’s largest peat bog is located in Western Siberia and is the size of France and Germany combined. Peat even made Russian headlines a few years ago with the 2010 forest and peat fires. It turns out peat briquettes are readily available online. Making a peat fire on the barbecue isn’t all that different from making a wood fire, except that it takes over an hour and half to get coals suitable for grilling. You do get plenty of good-smelling peaty smoke, and placing meat next to (but not directly over) the fire will smoke it without really cooking it. To continue with the Russian angle, I decided to make pork shashlyks. Lamb is king in the Caucasus and Central Asia, but Russia doesn’t have the same religious constraints, and pork is probably the most readily available meat. To compensate for its relative dryness, I’ve created a tomato jus. Through a rather expensive process, I transform over a pound of tomatoes into a few ounces of intensely flavorful sauce. Expect to see this jus make appearances in other recipes in future! Finally, I wanted to tackle what’s quite possibly the most ludicrous recipe one can make on a skewer, something I’ve seen in Armenia and Azerbaijan: potato lyulya-kebabs. 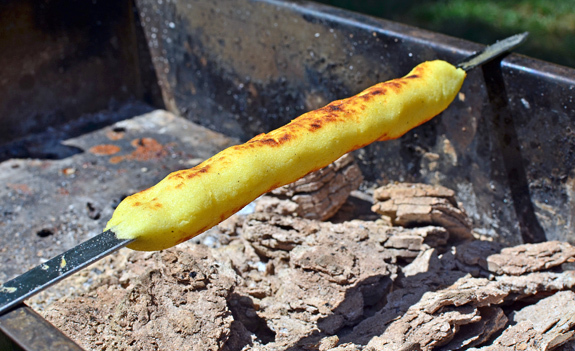 This gravity-defying challenge consists of mashed potatoes cooked on wide skewer, on the open fire of the mangal. Just like meat lyulya-kebabs, but harder, because there are no proteins to bind the mixture. I cannot tell you how many pounds of potatoes I lost to the hot coals before I got this recipe right. When it comes to potato purée, I tend to think that the more butter, the better (remember my knish recipe?). But this approach simply doesn’t work here. On the other hand, I don’t want to make a cement-like paste, as would certainly happen if I added flour. So I had to slowly reduce the proportion of butter until I got something that just held together. The final result still has (some of) the unctuous texture I like, making it better than most of the versions I’ve had elsewhere. Cut the tomatoes in half and place into an oven dish, cut side up. Drizzle with olive oil, and season with salt. Bake in a 200 C / 400 F oven for 1 hour. Lightly break the tomatoes down with a tablespoon to release more of the liquid, then bake for another 15 minutes. Let cool. Strain the tomatoes and their jus in a chinois, using a ladle to help mash out as much juice as possible. The amount of jus that you get seems to greatly vary with the tomatoes — I had around 180 g.
Place the jus in a saucepan over medium heat, and reduce to 120 g. Reserve. Cut the pork into 5 cm x 5 cm x 4 cm pieces. Grind the onion in a meat grinder, then mix in a large bowl with the red wine, salt, khmeli suneli, paprika, and star anise. Add the pork to the spice mixture, and toss. Transfer to a sous-vide pouch, vacuum-seal, and refrigerate for at least 24 hours. Take the pork out of the pouch, and arrange the meat on skewers (wide skewers are better). In a saucepan over medium heat, cook the potatoes in salted water with the pinch of saffron until done. Drain, and let rest a couple minutes. Pass the potatoes through the fine disc of a food mill, and into a bowl. Mix in the butter, and season with salt and pepper. Cover with plastic wrap, and refrigerate for at least 4 hours. Take the mashed potatoes out of the fridge and let sit for about 15 minutes, then divide into 4 portions, and shape into thin cylinders along 4 wide skewers. If the potatoes are too cold, they tend to be brittle and don’t adhere to the skewers. Be sure to use wide skewers, otherwise you’re guaranteed that your potatoes will fall onto the coals! And don’t be a hero; make very, very thin cylinders — you can only defy gravity so much. It also helps to pinch the kebabs at regular intervals to get some slightly thinner spots where the puree adheres better to the skewer when cooking. Make a fire on the mangal using peat briquettes. To start the fire, you can use small wood chips, newspapers and an odorless fire starter such as Frontier Eco Start Natural Lighter Fluid. Flip the briquettes every 15-20 minutes, and try to break them into smaller pieces. Make sure to keep an area on the mangal that’s free of charcoal. About one hour after starting the fire, place the shashlyks (on skewers, remember) on the part of the mangal that doesn’t have charcoal. Let the meat absorb the smoke for about 30 minutes. Brush the shashlyks with some tomato jus, and cook directly over the coals, turning frequently. Let rest for a few minutes once the meat has browned on all sides. 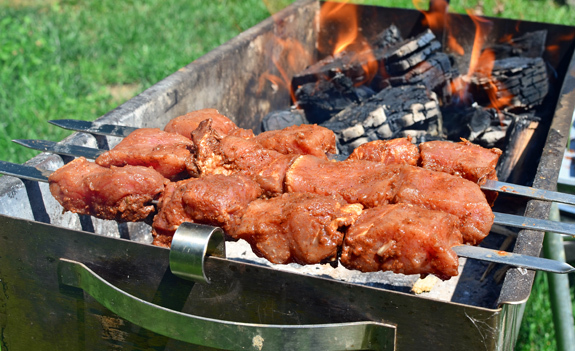 Return the shashyks to the grill, and finish cooking, still turning the skewers frequently. Cook until the internal temperature reaches 140 F, then reserve. After a few minutes rest, make sure the internal temperature has reached at least 145 F.
Place the potato lyulya-kebabs on the grill, and cook until golden brown on both sides. Do not flip the kebabs until they reach the desired color; every time you touch them, you increase your chances of the potatoes falling into the coals! If needed, reheat the shashlyks on the mangal for a minute. Microwave the rest of the tomato jus, and pour over the pork. Serve immediately. Hahahaha… Food perestroika, you say. That word was pushed down my throat in my Russian history class. I used to know its English meaning. Not anymore. Nice pork there, by the way. Has no one yet thought to say, “For Peat’s sakes!” Or is that just only an American expression, I suppose. Very interesting post, btw!